In our first tutorial about Inductors, we looked briefly at the time constant of an inductor stating that the current flowing through an inductor could not change instantaneously, but would increase at a constant rate determined by the self-induced emf in the inductor. In other words, an inductor in an electrical circuit opposes the flow of current, ( i ) through it. While this is perfectly correct, we made the assumption in the tutorial that it was an ideal inductor which had no resistance or capacitance associated with its coil windings. However, in the real world “ALL” coils whether they are chokes, solenoids, relays or any wound component will always have a certain amount of resistance no matter how small. This is because the actual coils turns of wire being used to make it uses copper wire which has a resistive value. 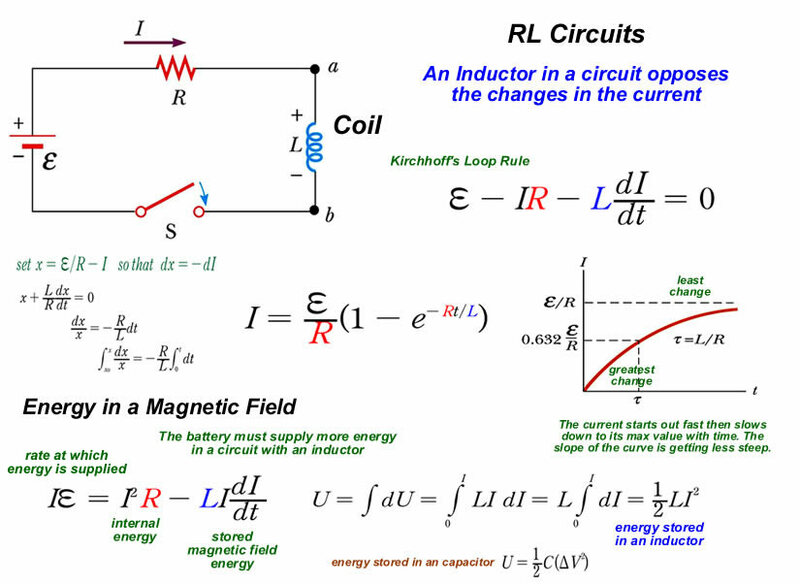 Then for real world purposes we can consider our simple coil as being an “Inductance”, L in series with a “Resistance”, R. In other words forming an LR Series Circuit. 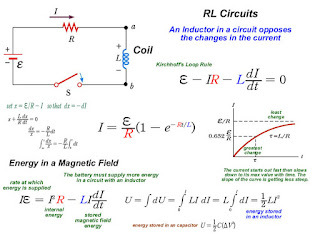 A LR Series Circuit consists basically of an inductor of inductance L connected in series with a resistor of resistance R. The resistance R is the DC resistive value of the wire turns or loops that goes into making up the inductors coil. Consider the LR series circuit below. The above LR series circuit is connected across a constant voltage source, (the battery) and a switch. Assume that the switch, S is open until it is closed at a time t = 0, and then remains permanently closed producing a “step response” type voltage input. The current, i begins to flow through the circuit but does not rise rapidly to its maximum value of Imax as determined by the ratio of V / R (Ohms Law). This limiting factor is due to the presence of the self induced emf within the inductor as a result of the growth of magnetic flux, (Lenz’s Law). After a time the voltage source neutralizes the effect of the self induced emf, the current flow becomes constant and the induced current and field are reduced to zero. The R/L term in the above equation is known commonly as the Time Constant, ( τ ) of the LR series circuit and V/R also represents the final steady state current value in the circuit. Once the current reaches this maximum steady state value at 5τ, the inductance of the coil has reduced to zero acting more like a short circuit and effectively removing it from the circuit. Therefore the current flowing through the coil is limited only by the resistive element in Ohms of the coils windings. A graphical representation of the current growth representing the voltage/time characteristics of the circuit can be presented as. The time required for the current flowing in the LR series circuit to reach its maximum steady state value is equivalent to about 5 time constants or 5τ. This time constant τ, is measured by τ = L/R, in seconds, were R is the value of the resistor in ohms and L is the value of the inductor in Henries. This then forms the basis of an RL charging circuit were 5τ can also be thought of as “5 x L/R” or the transient time of the circuit. The transient time of any inductive circuit is determined by the relationship between the inductance and the resistance. For example, for a fixed value resistance the larger the inductance the slower will be the transient time and therefore a longer time constant for the LR series circuit. Likewise, for a fixed value inductance the smaller the resistance value the longer the transient time. However, for a fixed value inductance, by increasing the resistance value the transient time and therefore the time constant of the circuit becomes shorter. This is because as the resistance increases the circuit becomes more and more resistive as the value of the inductance becomes negligible compared to the resistance. If the value of the resistance is increased sufficiently large compared to the inductance the transient time would effectively be reduced to almost zero. A coil which has an inductance of 40mH and a resistance of 2Ωs is connected together to form a LR series circuit. If they are connected to a 20V DC supply. a). What will be the final steady state value of the current. c) What will be the value of the induced emf after 10mS. d) What will be the value of the circuit current one time constant after the switch is closed. You may have noticed that the answer for question (d) which gives a value of 6.32 Amps at one time constant, is equal to 63.2% of the final steady state current value of 10 Amps we calculated in question (a). This value of 63.2% or 0.632 x IMAX also corresponds with the transient curves shown above. Where the first I2R term represents the power dissipated by the resistor in heat, and the second term represents the power absorbed by the inductor, its magnetic energy.